Alexander conquered most parts of the Western World, but there is a great deal of controversy over his invasion of India. In BC 327 Alexander came to India, and tried to cross the Jhelum river for the invasion, but was then confronted by King Purushottama (King Porus, according to the English rendition.) According to Indian history he was stopped by Porus at his entry into the country, but most of the world still believes that Alexander won the battle. Many of Internet links claim that Porus was defeated by Alexander, then he returned to Greece, giving back the Kingdom to Porus. This link from wikipedia says that "After victory, Alexander made an alliance with Porus and appointed him as satrap of his own kingdom". This is difficult to believe: IMO no noble king would accept his kingdom back after being defeated. Also claimed there: "Exhausted and frightened by the prospect of facing another giant Indian army at the Ganges River, his army mutinied at the Hyphasis (modern Beas), refusing to march further East. Alexander, after the meeting with his officer Coenus, was convinced that it was better to return." Did that mutiny actually occur? After traveling hundreds of miles from Greece and even winning the battle, why would Alexander return without conquering India? Specifically, I want to know what actually happened in the battle between Alexander and Porus: Who won? Was it true that King Porus defeated Alexander and made him flee back to Greece ? Whoever won the battle, Alexander or Porus, what historical evidence is there regarding what actually happened in that encounter? In regards to the battle between Alexander and Porus, both accounts are correct, in their own way. Alexander won the battle, and received an acknowledgement of such from Porus; Porus won the war, by convincing the Greek army (if perhaps not Alexander himself) that continuing was pointlessly expensive. Both sides saved face through the reappointment of Porus as Satrap by Alexander. The bulk of India then was not controlled by Porus, but by the Nanda dynasty, centered at Pataliputra. Porus controlled only a small section of India, close to Punjab (now divided between Pakistan as well as India). The Nandas were quite a powerful force, and the Greek troops had become war-weary (whether they actually refused orders is open to debate). So, Alexander reluctantly turned back without confronting the Nandas. When Alexander built his great empire, what he was essentially doing is taking over the Achaemenid Empire piece by piece, at a point when the empire was weakened by internal fights. The Kingdom of Pauruva is sometimes claimed to have lain outside the Achaemenid empire, but earlier Persian rulers seems to have claimed it was a part of the empire. This indicates that perhaps Porus his predecessor had already been paying taxes/tributes to the Persian empire, which doesn't make it surprising at all that Porus would accept a similar agreement after losing a battle. That then brings us to the question of why Alexander didn't continue? And here we have to speculate a bit: It's probably the same reason that the Persians earlier didn't continue. The kingdoms further east probably were too powerful, so attacking them was not sure to win, at the same time they are too far from the centre of the empire, and so makes hard to extract taxes from. It's likely that both in the case of Darius and Xerxes as well as Alexander, even though they conquered the Kingdom of Pauruva, it was just too costly and too far away to be worth it, and too hard to keep hold onto, showing that the empire building had come to it's eastern limit. Who won the battle ? Well as pointed out by others, it is not quite sure who won the battle i.e. "The Battle of Jhelum". Alexander being the great king would have had a victory in that battle. But according to Battle of the Jhelum analysis which gives valid reasons why Alexander would have lost the battle taking into consideration of his exhausted army which had already fought many battles and had a long journey across the plain. The given website explains them in detail including the geography factor and elephant factor. Also in my opinion, Puru (Porus) is from Vedic Tribe Pandava dynasty. Not much information is available about his life or about his success or failure in the war against Alexander due to loss of historical texts ! (I see this as the main reason that we lost the history about a king). Another point is the existence of Nanda dynasty which was very strong across the North India next to "Puru Dynasty" (King Porus). But there is one fact which see very interesting. There was a person named "Chanakya" political theorist and scholar from Taxila. (Remember Taxila was defeated by Alexander before his journey to Punjab !). Chanakya gives a warning message to King Dhana Nanda of Nanda dynasty that Alexander is invading but the King Nanda ignores this warning as he does not see any threat from Alexander ! Because Nanda's army was huge and Alexander had no match to Nanda's army ! So to summarize, from my first point though I mention the reasons to Alexander's "lost" but I want to say that at some point of time the battle was not won by both the army but both kings made some pact or agreement ! From the second point I would say that Alexander could not invade India because India (back then India was called Aryavartha because it had several kingdoms) was not ruled by one king but many. So with the small army it was not possible. Alexander won ONE battle. That does not necessarily mean that he will win the second or third. By being able to appoint Porus "Satrap," Alexander got the "props" for winning the first battle. By accepting the position from Alexander, Porus got to keep control of his country without risking a second or third battle. It was a "win-win" (limited victory) situation for both sides. Each got what they most wanted out of the situation without having to risk everything. I like to point out two reasons behind Alexander's return without conquering India which is not identified in this answer till now. From Madison to North-West India, Alexander faced few wars. We may say that his army first faced a war after coming to the Indian Border i.e. the battle with Porous beside the Sindhu. Distance from Madison to India was very big and his soldiers were unwilling to go any more. Modern Bengali were called Gangaridai at that time by Greek historians. They were a very strong fighting Indian community. They were very brave and became a greek myth. Porous fought bravely against Greeks. He also had solders from this community. Alexander saw their courage and braveness face to face in the time of war who were in his mythological stories. It forced him to come to the decision not to go any more inside India. The given link will enlighten records available in modern age about Gangaridai and show the relationship of them with Greeks. This is a grey area of history. While the Porus-Alexander story is legendary, there is no guarantee that it actually took place. Neither is there any guarantee that it did not. And there the matter lies as on date. The Alexander episode does not find much mention in the entire written record, that is the strangest aspect of it. Neither is there any record of the presence of any King called Porus in North-Western India during that time. There are very few references in Indian records, which is a very curious and noteworthy aspect of this matter. The closest one comes to it is the Puru Tribe of Northwest India. Beyond that, there is little evidence. Remember that initial history was written by Europeans; a few of these initial writings are beginning to be challenged as new evidence emerges. There are quite a few gaps in the accepted records; even for established figures like Ashok. In Ashok's case, the narrative throws up significant differences in the approach of The Ashokavadaan and the other books from that time: like the Mahavamsa. The 2 simply do not reconcile in most of the important details of the emperor's life. Similar is the case of Alexander. The only thing that is certain is that the supposed invasion does not merit a detailed coverage in any Indian records from that day. 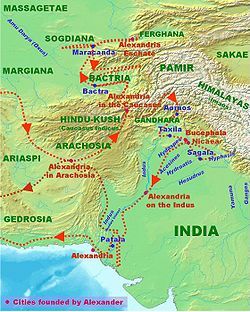 In 327 BC Alexander, in his march against Emperor Darius empire, came into India.This lasted for 2 years. There is no record in Indian sources of his exploits, and there was little consequence of his invasion in the long term. He came to India to reach the easternmost parts of Darius' empire - reach the ocean. This ran into trouble along the Sindhu river (Indus), and he then went along the river, fighting many battles - Puru, subduing of the Gana-Sanghas, Battle with the Malloi where he was injured - and exacted a brutal revenge. There are men said to be 10 feet tall and six feet wide; some had ears reaching down to their feet - Megasthenes in Ancient India as described by Megasthenes and Arrian. This does not mean all of their observations were hogwash, some were accurate. They are supposed to be a mix of fact and fable. In all history texts that I have read (please dont refer online or western sources for this) the entire Puru episode does not include more than 4 lines. There is no guarantee of the accuracy of that episode. That battle did take place is about the only thing that is certain; as is the fact that Alexander won. As to the rest - could be conjecture, or could be fact, No Idea. Alexander did not return after defeating Porus (or the puru tribe); he went further along the river. He was actually injured in the battle against the Malloi; not against Porus. He did decide to turn back after the Puru battle, but he instead went further along the river, thinking that this is the river Nile. They discovered their mistake on reaching the ocean, and then subsequently turned along the Makran and Persian Gulf coast. That is all that is known - all from Greek records. None from Indian records; which are silent on this, which is very curious indeed. It is only a theory that Alexander moved back encountering elephants (for first time ?). Having won the most of walk-able world Alexander would have seen different cultures and learnt all techniques. And, I believe, elephants are not so difficult to face in the following context. Wars are wars and they don't happen just after sunrise as we see or visualize. Burning homes, poisoning drinking water, terrorizing civilians, bribing for a win, all that I can remember. So elephants could have been easily poisoned/killed during night/"trained not to walk" with local supporters, etc. As posted above, manageability must be the issue. He didn't want to settle down in India. Secondly India had too many small kings and it would have been so easy for Alexander to buy some of them. So, I believe he left coz he wanted to. actually the greek force was fearful of the great Nand king that was ruling the vast empire of Magadh from its capital patliputra(modern patna and gaya area).he was tyrant but had a huge army under his command including elephants expert in war.had alexender moved to eastern part of punjab there was chance of direct confrontation with nand king .hence was compelled to retreat. Alexandar did not have a single battle with Pourus. He had at least 2. Alexandar also had several small battles with small independent republics. AFAIK, Alexander lost the first battle to Porus because of the landscape. The Greeks were not used to Elephants and were surprised/terrified. Call it a retreat or loss, the next battle Alexander waged, he was assisted by rival kings of Pourus. Porus had an important place, but he was not a King of a great empire. Porus is important because he controlled the border areas; so just military might is not important here. When the battle weary Alexander's troops realized that they just defeated the King who guards the walls of India, and the mighty empire is 300 times bigger than the recently concluded battle, they lost all heart. Moreover, the Greeks were forming alliances/conquering small independent republics whom they could not control and trust after subduing; and they had a long way to go before reaching the Nanda dynasty. Chanakya was able to overthrow the Nanda dynasty without waging a real war/battle. Nanad's council was concerned about the direction their King was taking and needed someone with political will and stragegy to help them overthrow an emperor without the risk of being called traitors; that is how the Nanda king was overthrown. There was no huge war, just a couple of Raids, and Nanda was betrayed by his own army. Alexander and his army were defeated by King Porus. We can infer this by two points the greeks make themselves. One, Porus remained King and his territory doubled and two, alexanders treasury was given to Porus as an act of 'friendship' even though he did not have enough gold to pay his men. From what I have read, the Romans were slowly losing a long war with the Persians 300 years after the time of Alexander and needed some propaganda for their troops/people. Most of the accounts of alexanders 'greatness' was penned at this time by Romans, not greeks. Its is unbelievable that Alexander would actually win and then return the kingdom back to Alexander. This violent Macedonian who razed everything on his path would be unlikely to do so. Also, remember he did not actually reach Greece. According to the Greek accounts he died on his march back to Greece. The more logical conclusion is that he not only lost the war to Porus but also likely died from the injuries sustained from that war. I believe Alexander lost heart after his horse, Bucephelus, died from a wound received in the battle against Porus. This is the horse which had carried him to victory across Greece and Asia. There was a bond between these two that can only be forged in battle together. He was easily persuaded by his men to abandon any plans to conquer the land of India. He sent many thousands of his men back to Rome, while reinforcing his remaining army with cavalrymen from the defeated Persians. This force then traveled south to the sea rather continuing into the heart of the land we know as India. Ironically, with the addition of the Persian cavalry, Alexander was probably very well suited for battle against the forces in India. Certainly the horses would help when they encountered elephants in battle. Not the answer you're looking for? Browse other questions tagged ancient-history india ancient-greece alexander-iii-greece or ask your own question. Why did Alexander the Great spare Porus's life? Did King Porus's men use snake poison against Alexander's troops?